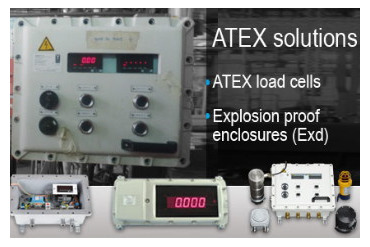 To meet increasing demands from industry for ways of measuring force in potentially explosive environments, SENSY has developed a complete range of ATEX-certified weighing load cells as well as force and torque transducers. Zone 2: presence of an explosive mixture unlikely to occur during normal operations, but if it does will only persist for a short period. Zone 22: presence of an explosive mixture unlikely to occur during normal operations, but if it does will only persist for only a period. SENSY provides a wide range of Zener barriers and galvanic isolators in order to comply with the intrinsic safety rules. We also offer a complete range of ‘Ex d’ certified explosion proof enclosures for electronics that are used in hazardous atmospheres. These enclosures are designed to contain amplifiers, displays, load limiters and Zener barriers or galvanic isolators, etc. The transducers, but more often, the explosion-proof enclosures are tailor-made to better meet the required specifications. Since our first ATEX certification in 1997, we have developed a great deal of experience in this field. More recently, we have been awarded two new intrinsic safety certifications: CSA (for the USA and Canada) and IECEx (worldwide). Not only do these certifications impose additional technical constraints, but they also enforce compliance with a specific quality assurance system, thereby guaranteeing quality. And, as expected, our quality system is also EN 13980 certified.